I went to Spago with absolutely no pre-conceived notions or expectations, all I knew was that they've got a mascarpone cake on the menu that is unmissable- WAIT FOR IT! 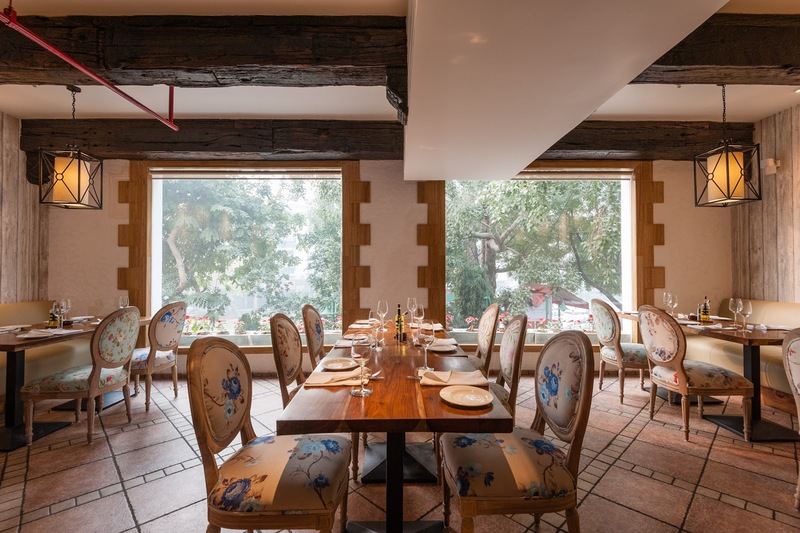 The restaurant's located on the first floor of Kasbah in GK, N Block Market, right below Zaffran and though small, was quite spacious. I loved the look of the minimal decor, vintage upholstery and soft Italian melodies playing in the background. I was welcomed with a tray of assorted Italian bread and pesto. I swear I could have eaten it all up if I wasn't sg my appetite- it was SO delicious. If you're a wine person (and not a wine-illiterate like me since I couldn't even spell half the names of on the menu), you'll be spoilt for choice. Otherwise, they have quite a few options in cocktails and mocktails. I started off with an Appletini- a virgin mojito with mint and apple. Go for it if you want something sweet and refreshing. Next up, Pizza Exotica was one of the best thin crust pizzas I've had in the city. The toppings included sundried tomato, sweet corn, olives, asparagus and zucchini with some good ol' mozzarella. The best thing about the pizza was definitely the perfectly baked crust (they also offer whole-wheat crusts) Pro tip: you might have to wait 20 minutes to get your pizza so order accordingly. I then moved on to Spinach and Ricotta Ravioli in Pink Sauce. The stuffing is just what I was hoping for and the sauce, a mix of red and white, tangy and cheesy. The best part of my evening was Torta Royal, a hearty white chocolate and mascarpone cake. The hot cake arrived sitting on liquid white chocolate and one dig into it, the liquid cheese oozed out like perfection. Go here for the desserts, you won't be disappointed. All in all, Spago scored well on all fronts- taste, service and ambience.